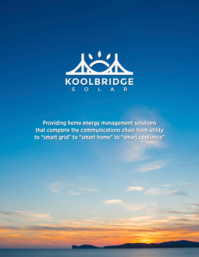 Koolbridge Solar, Inc. designs, develops and sells innovative electrical products that allow solar energy to be integrated into homes more efficiently and cost-effectively, to help reduce energy bills, and to provide greater electrical supply reliability. We will accomplish this with our first product, The Smart Load Center™. Solutions that complete the communications chain from utility to “smart grid”, to “smart home”, to “smart appliances”. The Smart Load Center™ is a solar / utility energy breaker box or panel box that can automatically select the use of electrical power from the utility grid, solar panels, batteries, generator and even wind power. The automatic selection of power sources uses a microcontroller to activate the dynamic switching of each breaker circuit based on availability of utility and solar power; preset user priorities, battery charge status, time of day, instantaneous consumption, historical consumption patterns and weather conditions.